Written with contributions from Olsi Nika, EcoAlbania and Egnatia Association. 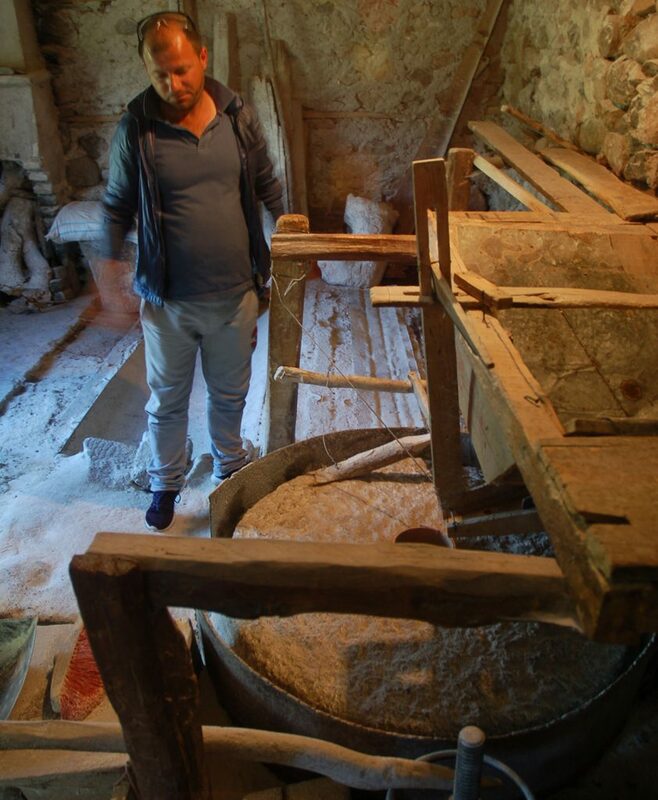 “Mills don’t grind if you give them no water,” says Xhevahir Shkurti, an owner of a water mill in the village of Rapuni in central Albania. Until a year ago, Shkurti family’s mill ground grains for 15 communities dotting the adjacent mountains. With as many as 200 people descending down the valley to mill their corn each month, Xhevahir’s two sons helped with milling. Now when Xhevahir’s son Perparim puts the water on, the millstone that pre-dates the times of Albania’s dictator Enver Hoxha does not even set in motion. “The hydropower plant has taken all our water”, complains Perparim pointing to the powerhouse standing on the Qarishte river in a close distance to the mill. The crystal clear water in the channel that connects the river with the mill now disappears in a concrete tunnel. The water now runs through a powerhouse that is part of the Rapuni 1 and 2 cascade, one of over 300 new hydropower projects planned in Albania. With the output, the country’s government intends to generate electricity for domestic consumption and for export to the European market. Whereas some question Albania’s perpetuated reliance on a sole energy source, the susceptibility of waterpower to climate change and the uncertain future demand for Balkan electricity exports, hydropower keeps receiving state incentives and support of international financial institutions. 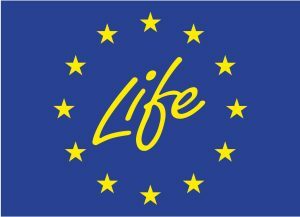 Next to a state guarantee that the electricity from Rapuni is purchased through a fixed tariff, the Rapuni cascade was built with a public finance loan from the European Bank for Reconstruction and Development (EBRD)*. The London-based EBRD finances investments that are to bring development and stimulate the uptake of renewable energy sources in the former eastern bloc countries. Yet, rather than representing progress, hydropower is increasingly seen as a symbol for the destruction of livelihood for common people like the Shukrti family. One of Xhevahir’s sons standing next to the millstone that has become useless. “What is good in electricity if people have no bread to eat?” asks solemnly Xhevahir Shkurti as he glances over the stones lining the empty bed of the Rapuni river, the parent river of Qarishte. His glance wanders towards the 10-meter high dam structure on the Rapuni and houses and fields downstream from it. Once freely running, the Rapuni river was an important vein that provided water for irrigation to riparian hamlets and villages in the nearby district town of Librazhd. 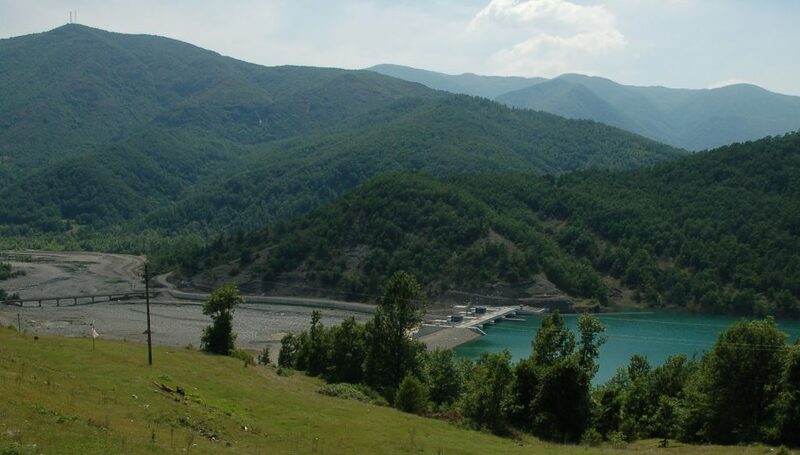 Its destiny was decided in 2008-2009 when Albania went through a period of hydropower concession frenzy under then prime-minister Sali Berisha. Two separate concessions for the plants Rapuni 1&2 and Rapuni 3&4 were acquired by C&S Construction. The company kept the concession for Rapuni 1 and 2 on the Qarrishtë river and later sold the Rapuni 3 and 4 concession to the Albanian Orthodox Church. The design was changed and Rapuni 3&4 became one project, including the 100m wide dam with a sizable reservoir. Despite changing the owner, the Rapuni river scheme stays closely interconnected with the cascade on the Qarrishtë river. All the water discharged by Rapuni 2 gets transferred through an underground pipe into a diversion tunnel that brings water from the Rapuni 3&4 dam to its powerhouse. The river stops at the dam. This set-up allows for a maximum power generation by the Rapuni 3&4 plant. However, it leaves very little water in the Qarishte river, insufficient to move Xhevahir’s mill. The Rapuni 2 dam itself does not discharge the water into the river. As a consequence, no water is left in the river between the Rapuni dam, past the confluence with the Qarrishtë river and until the Rapuni 3&4 powerhouse that is located nearly four and a half kilometres downstream. 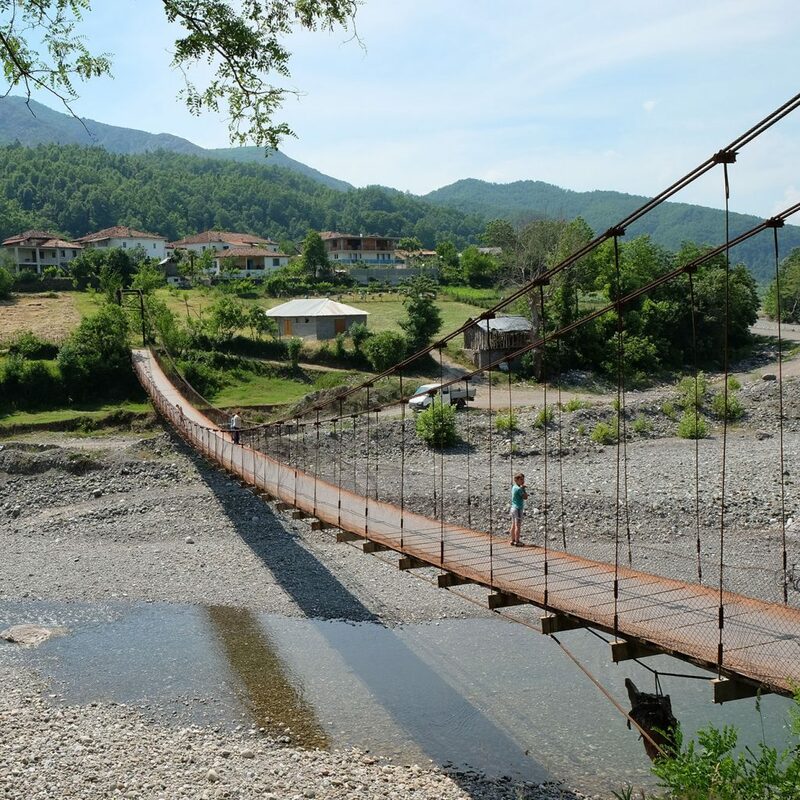 The Rapuni 1 and 2 projects are located within the Shebenik-Jabllanicë national park, the youngest national park in Albania with untapped tourist potential and an abundance of wildlife. Despite its natural richness, over 40 other HPPs are slated for construction within the park’s territory. While the effects of all the Rapuni plants on the local ecosystems and communities are visibly stark, there is no publicly available documentation that would identify the cumulative impacts on the river basin. The lack of an assessment of cumulative impacts is even more striking given the involvement of the EBRD whose standards oblige its clients to provide such an assessment. “We have repeatedly checked the situation at Rapuni 3&4 and we have not once seen water running through the river.” says Agim Blloshmi from the local nature conservation group Egnatia. “The hydropower plants are killing all life in the river. We came here shortly after the plant started operating in August 2016 and found hundreds of dead fish in the river bed. The dam’s gates open only to let sediments out but they do not release a drop of water” he adds. The Rapuni 3&4 hydropower scheme has been erected with investment by the Albanian Orthodox Church and financing by National Bank of Greece. While the Church has stated it would use the proceeds from the electricity sales for its social work, it has shown so far little sensitivity to the impacts its social business has left in the Rapuni plants’ backyard. 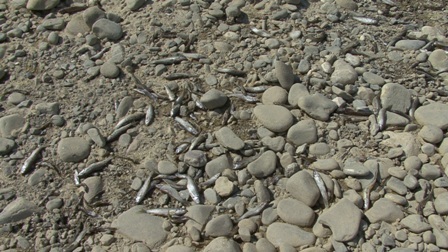 Shortly after the plant started operating in August 2016, a local conservation group found hundreds of dead fish in the river bed. 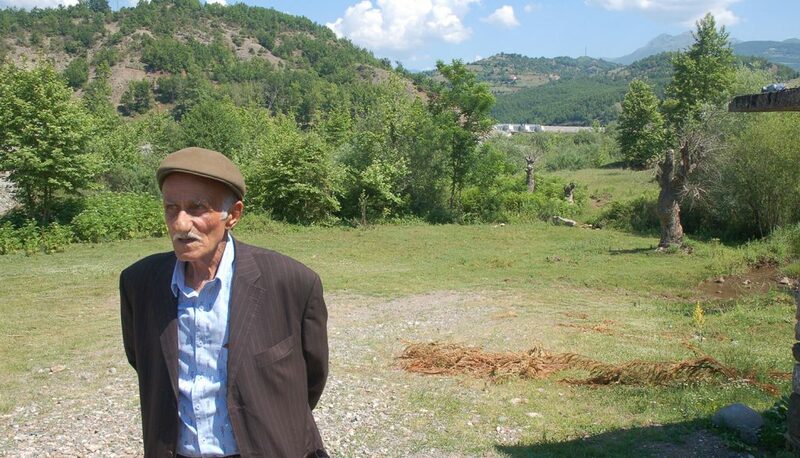 “These cracks appeared when the construction on the underground water diversion tunnel started in 2013” says Ismet Çota from the village of Togez, pointing at cracks in the walls of his house. Although over 30 households in the village of Togez have suffered similar damages, they have been waiting for years for a resolution of their compensation claims. In 2014, Togez residents signed a memorandum of understanding with the Church and the daughter company of C&S Construction about the compensation for damages on their houses caused by the construction works. Yet until recently the inhabitants have been kept in the dark over the level of compensation and the payment timings. Finally, at a meeting in June, the subcontractor offered a specific sum of money. But a number of people complain that the compensation is a drop in the bucket, too low to compensate the extent of harm on their property. Xhesar and Lutfie Çota say they got an offer of 80.000 Lek (600 EUR) as compensation. But they have already spent more than this to repair the first floor of their house. They claim more money will be needed to repair the rest of the house including the ceiling that was damaged because of the blasts during the construction of the Rapuni hydropower. As the summer is approaching the residents of Togez turn anxiously to the newly laid irrigation pipes that should bring water to their fields. They claim having received little or no water from the river since all the resources had been put into the hydropower diversion pipes. They have resorted to using drinking water for watering the vegetable gardens and depended on the mercy of the weather for the rain to water the larger fields. Whilst people in Togez and other hamlets along the Rapuni river argue they were not informed about the plans to build the plants and their impacts, hydropower has bitterly cut into their lives. The hanging bridge over the river is a sad reminder of the once wild running Rapuni. It is also a memory of times when people and animals depended solely on its waters and not on negotiations with hydropower companies.